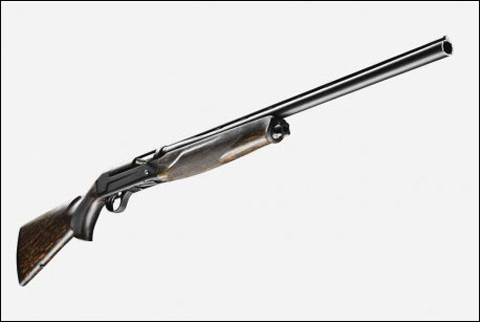 The new gun was designed in conjunction with Italian gunmaker Breda and features the legendary Breda inertia action reloading system that was perfected by Italian inventor Bruno Civolani. 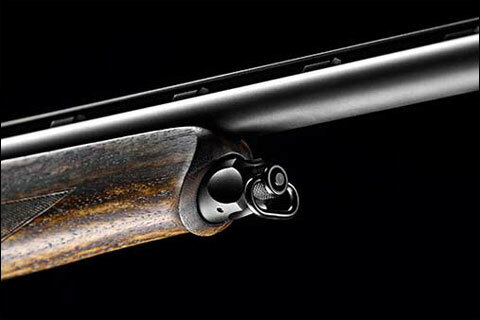 The rest of the gun was designed around that receiver by Sauer engineers, and the look of the gun is most impressive. The Sauer website describes the look as “timeless elegance,” which has been a trademark of J.P. Sauer and Sohn firearms for years. The Sauer SL5 inertia semiauto marries contemporary and classical design elements. 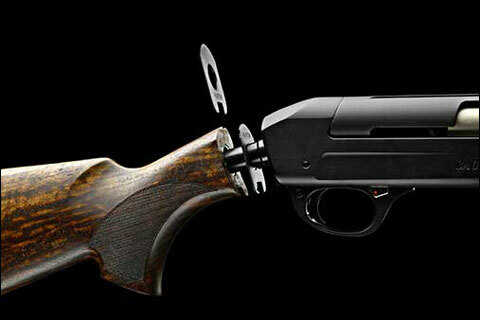 The Sauer SL5 in hand is a very well-balanced shotgun that weighs just under 6 ¾ pounds. The gun features an aluminum frame and is chambered for up to 3-inch ammo and comes with five flush mounted chokes (Cylinder, Imp Cylinder, Modified, Improved Modified and Full). The length of pull on the gun is a tick short of 14½ inches. The barrel is chrome lined and has been proofed for steel shot ammunition. Purchasers have the option to select a 28- or 30-inch barrel, which has a 7mm vented rib. The direct pull trigger is set at 5½ pounds. All metal parts feature a satin finish, which greatly reduces glare and inhibits rust. The gun comes packaged in an attractive black ABS case. The magazine in the Sauer SL5 will hold four 2 ¾-inch shells and three 3-inch shells. This gives hunters a capacity of five 2¾-inch or four 3-inch shells in the field with the plug removed. 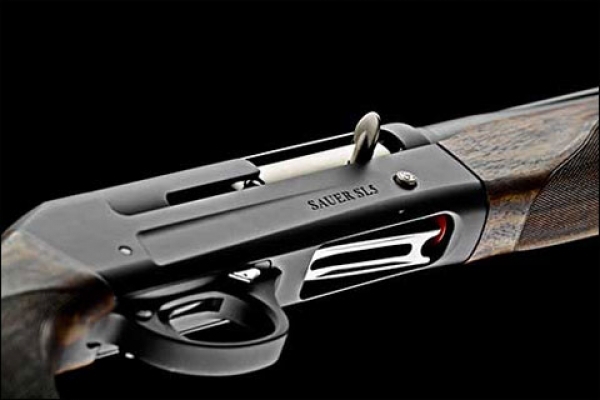 Those who know the Sauer brand are fully aware of the great wood that the company puts on their rifles and shotguns. The beautiful laser grained walnut stock and forearm on the SL5 is no exception. While the look of the wood is much like you’d find on a very high-grade shotgun, it almost looks like the gun has a camouflage finish. The Ergofit Inlay shim system on the Sauer SL5 semiauto. Like many semiautos these days, the Sauer SL5 features their Ergofit Inlay shim system which allows the user to slightly change the drop or cast of the gun to provide a more perfect fit. This is a great feature that will most certainly make the gun more comfortable to shoot once the shims are set for the shooter. For hunters who choose to add a sling to their shotgun for walking distances, the Sauer SL5 comes with a pair of Sauer Quick-Fit sling swivels utilizing push button QD mounts. The Sauer Quick-Fit sling swivel on the forend cap of the SL5. Sauer heavily promotes the handling of the gun with terms like “shootability” and “instinctive speed,” but as with all guns the proof of those marketing terms comes to light when you actually take the gun to the field. As the host of the If It Flies… television series seen on the Pursuit Channel, I had a chance to actually shoot the new SL5 on a sporting clays range as well as a late season snow goose hunt in northeast Arkansas. The results were impressive. Prior to my hunt, I took the gun to the clays course at Forest City Gun Club in Savannah, Georgia. The Sauer SL5 offered a different feel from my Blaser F16 sporting gun. I found the semiauto well balanced and lightning fast to the targets. The recoil was in no way excessive with any of the clay loads I used and the targets broke consistently. While at the club, I decided to shoot some patterns with the hunting loads I planned to use on the snow goose hunt. My choice of ammo for that hunt would be either 3-inch Kent Tungsten Matrix #1 or 3-inch Winchester Blind Side BB. After shooting some 40-yard patterns, I made the choice to go with the Modified choke for the goose hunt. The Sauer SL5 demonstrated impressive pointability. Sauer markets the SL5 as a hunting gun, and I can honestly say that I feel that it would be a perfect choice for upland hunters. The light weight and superb balance are features that upland hunters look for. But for waterfowl? I must say that the Sauer SL5 is almost too pretty to put in a duck or goose blind, but once there, the gun performed brilliantly as multiple doubles and even a triple of snow geese were the norm for each of the three days of the hunt. The pointability of the gun was impressive as it moved quickly to each bird. Surprisingly the recoil was not excessive, even though it was more noticeable than on the clays course, as expected. The MSRP for the Sauer SL5 is listed at $1,895, which is near the top of the inertia action semiautomatic shotgun marketplace in price, but the overall feel and balance of the gun coupled with its elegant appearance seems to warrant that price point. And make no mistake, the Sauer SL5 truly is a “shooter” and the “shootability and “instinctive speed” of the gun that Sauer promotes are spot on.